It's breakfast time, so that means it's time for Synchronised Diving! I honestly feel that this should be a permanent thing. I'm indifferent to whether to participants would be the usual newsreaders and whatever the hell you call the ones on GMTV, or your actual divers. All I know is, it's exciting, splashy and just the right amount of bewildering for the bleary eyed. I have been watching Synchro Diving now for three days, and I have a number of questions. Firstly: if one of the divers bangs their nut on the board, does the other one have to do it as well in order to maintain high synchronicity scores? Second: Why does the diving pool have nozzles attached to the the diving platform, constantly hosing fresh juices into the pool? Thirdly and most importantly - why do the divers all have showers after every dive? What have they filled that pool with? My suspicion: meths. There is one thing which I feel is beyond question by this point, and that's the scoring. My deep dislike of sports decided by judges scores is likely to be a running theme in the coming weeks, but with the diving, even the commentary team seem to be a little bit confuddled as to exactly what the hell is going on with some of the marks. The judging panel, no doubt, will point out that we should expect no better from people from a country who have finished last in three finals. However, it is equally valid to suggest that the a large part of the reason for this is them all playing X-Factor. I'm not, let's make this very clear, suggesting any impropriety. I think it would be nice, though, if the judges were to be more accessible to us plebs. In events where they are the kingmakers, a little bit of accountability and explanation would be most welcome. 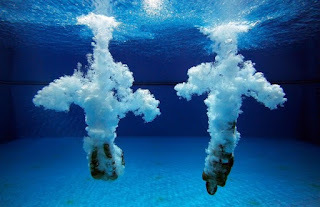 The synchro diving is one of those sports which works on two levels. You could enjoy it if you understood all of its vagaries, but it is equally easy to get rewarded just for watching it for its aesthetic properties. However, in the spirit of the Games - and until the judges come down from their ivory tower - I thought I'd do some research and try to unlock some of the secrets of the sport, to give us viewers a deeper and more satisfying level of enjoyment. So, I present my Olympic Synchronised Diving Jargon Buster. This is a dive completed whilst eating a Mars Bar. It is particularly popular amongst the high-board divers. The 3 metre competitors prefer a fun-size. Very tall competitors may favour the Mars out of a box of Celebrations, but it is worth bearing in mind that this will subtract significant difficulty marks from the dive. This dive is notable for the presence of a large fish in the leotard. A dead example is most common, but the most adventurous competitors will go for the live pike. The diver will enter the water thinking thoughts - usually of a sexual nature - so improper it would be possibly illegal to vocalise them. A dive completed whilst wearing a tweed cap, mutton chop sideburns and a pipe. A Single Jethro sees one competitor so attired, a Double Jethro has both. With a sheep under one arm. Here the diver is expected to convert to Protestantism before impact with the water. A dive which earns the maximum 4.0 for difficulty. Both divers are within a single pantomime horse costume. The really world-class divers will also be able to lift the tail and shoot an arc of diarrhoea before the splash.